NASA astronauts Doug Wheelock and Tracy Caldwell Dyson, both Expedition 24 Flight Engineers, work to remove a failed ammonia pump module on the International Space Station's S1 Truss during a spacewalk on Aug. 7, 20102010. Thisstory was updated at 11:51 a.m. ET. Twospacewalking astronauts floated outside the International Space StationWednesday to take another shot at removing a faulty ? but crucial ? coolantpump, this time taking special steps to free a stuck hose and avoid the type oftoxic ammonia leak that thwarted their initial attempt. NASAastronauts Douglas Wheelock and Tracy Caldwell Dyson ventured outside the spacestation on what they expect to be a six-hour job to removethe disabled pump, which is about the size of a kitchen oven. Abouttwo hours into the spacewalk, they finally detached the stubborn ammonia hosethat hampered their first repair attempts in a Saturday spacewalk. Wheelock hadto use brute strength to loosen the hose, but ultimately detached it to thedelight of the astronauts and Mission Control. With the hose out of the way,the spacewalkers finally pushed forward with the pump's removal. "This will allow us to get our station back," Wheelocksaid. "Back in action." Thespacewalk began at 8:27 a.m. EDT (1227 GMT). It is the first of three aimed atreplacing a faulty ammonia pump and restoring the space station's coolingsystem to full strength. "Sunlight? sunlight coming out," Wheelock said as he looked out of the station'sopen hatch just before stepping out to begin the spacewalk. "Wow,that's nice and bright," Dyson responded. Wheelock and Caldwell Dyson did not have to close two valves in hoses upstreamof the pump or vent any remainingammonia coolant overboard before removing the last of four ammonia hoses fromthe faulty pump. 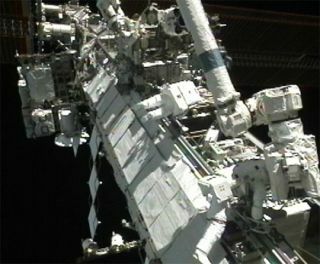 TheInternationalSpace Station uses liquid ammonia to cool its onboard systems bytransporting waste heat to a network of radiators mounted to its main truss. Spacewalkingastronauts take care to avoid exposure to ammonia (which freezes into flakes when it leaks) while working outside andhave lengthy decontamination protocols to clean their spacesuits when they dosee leaks in order to avoid bringing the toxic chemical inside. Wheelocksaid he only saw a few flakes of ammonia while detaching the pump's final fluidhose Wednesday, far less than he saw during the Saturday spacewalk. Thefaulty ammoniapump failed July 31, knocking out half of the space station's coolingsystem and forcing astronauts to turn off some experiments and systems, as wellas leave others without backups, in order to prevent the station fromoverheating. A tripped circuit breaker, likely caused by a power spike, causedthe malfunction, station managers have said. Thereare two main coolingsystem loops ? Loop A and Loop B. The failed pump is in Loop A, while theother cooling loop remains operational. Wheelockand Caldwell Tyson don't plan on completing their space station repairs duringWednesday's spacewalk. That comes on Sunday, when the astronauts plan toperform a third spacewalk to retrieve a spare pump from a storage platform andinstall it in the old pump's place, station officials have said. Eachpump weighs 780 pounds (353 kg) and is 5 1/2 feet long (1.6 meters) by 4 feetwide (1.2 meters). They are about 3 feet (almost 1 meter) tall. The failedammonia pump is located on the station's right side truss and will be replacedwith one of four spare pumps stored at the orbiting lab. Spareparts are a key concern for the International Space Station, which is nowslated to keep flying through at least 2020. After next year, no NASA spaceshuttles will be flying to the space station to deliver large spare parts orsupplies. NASAplans to fly two more shuttle missions (in November and February) beforeretiring its orbiter fleet for good next year. NASA would need approval to flya potential third shuttle mission, which would fly next summer if approved. Lastweek, the Senate passed a NASA authorization bill that would approve that extrashuttle flight, though the House vote on its version of the bill is stillpending. NASAis broadcasting the International Space Station spacewalk repairs live fromspace on NASA TV. Click here for space stationmission updates and SPACE.com's NASA TV feed. Thisreport has been corrected to reflect that the spacewalkers did not have to vent ammonia or close extra valves for today's repair work.